Every week at The Center Circle, we are highlighting a different player in a feature we call “On the Spot”. We’ll take a look at superstars, underrated gems, aging veterans, and young unknowns who should be known. We’ll peruse their club and international careers, taking note of their teams, statistics, and highlight reels. We’ll illuminate their strengths and weaknesses and comment on their personalties and reputations. It will be some fun. If there is anyone you want to see “On the Spot”, feel free to comment below. First up, the always-controversial Mario Balotelli. 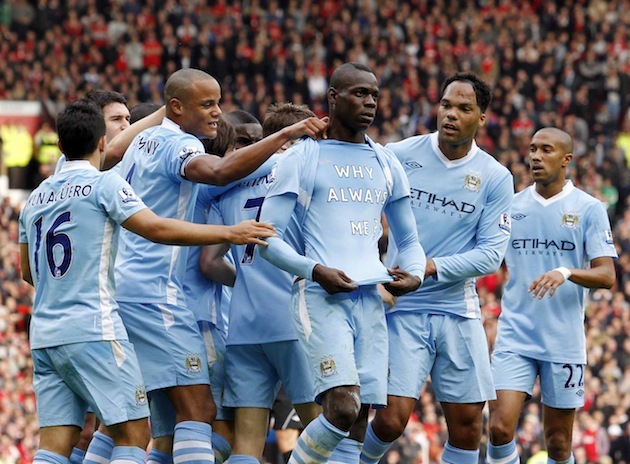 Why always Balotelli? I’ll tell you why: Because he’s irresistible. Because everyone wants to know what he’s going to do next. Because he makes headlines and probably always will. There is something so alluring about this man’s talent and personality that you can’t look away, because what will he do next? Well, the most recent thing he has done is make the switch from Nike to Puma. 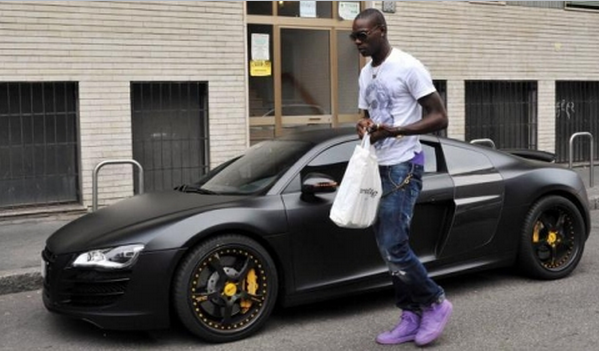 He created buzz for this by sporting those soon-to-be-infamous newspaper boots (now known to be the Puma evoPOWERs). He makes just as much noise off the field as on it, and that is what drives the attention around him. But, what actually makes Balotelli so irresistible? Mario Barwuah Balotelli started at Italian club Lumezzane at the ripe age of 15 in 2006. After an extremely short stint with the first team there, he was purchased by Inter Milan, where he made his Serie A debut in December of 2007. 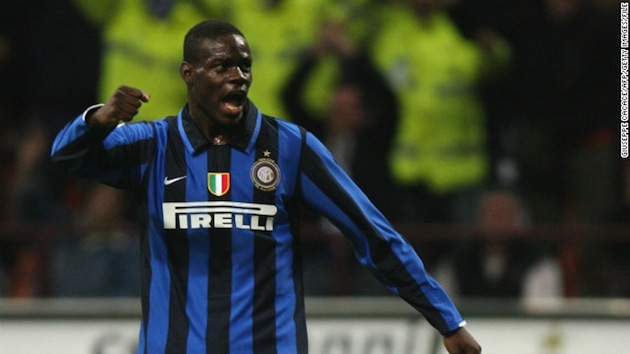 Inter was in the midst of a 5-year run of league championships and Balotelli’s presence only enhanced their chances. Providing 20 goals in 59 appearances between the 2007-10 seasons, his time there wasn’t without strife. His relationship with new Inter manager Jose Mourinho was never pleasant for Mourinho’s two seasons there (2008-2010). Although they were dominating Serie A with top players such as Zlatan Ibrahimovic and Javier Zanetti, Balotelli could never fully break into a starting role under Mourinho. The fans were also fed up with his antics and it became clear he needed a change. Manchester City stepped up to buy Balotelli in August of 2010. This reunited him with his former Inter manager Roberto Mancini and shot him to international fame. At the end of 2010, Mario won the Golden Boy award, given to the top under-21 European player. Past winners have included Wayne Rooney, Lionel Messi, and Sergio Agüero. Man City finished tied for second with Chelsea in the EPL that season and Balotelli had 6 goals in just 12 starts, putting him 3rd in goals behind Carlos Tevez and Yaya Toure. The next season saw The Citizens take off. They won the league on the last matchday after a game-deciding goal from Agüero, assited by Balotelli himself. It was their first league title since 1968. However, it wasn’t all roses for Mario that season. Manager and frequent Balotelli-defender Mancini gave up on him after he was issued a 3-game ban. Even though he finished with 13 goals in 23 EPL appearances in the 2011-12 season, he was sold by the club in January 2013 after a lost half season saw him only appear in 7 EPL matches because of suspensions. Since joining AC Milan and returning to the top Italian league, there has been more ups and downs. Last season they finished third in Serie A, but this season has been a true struggle, as they currently sit 13th in the league. Mario’s form hasn’t really dropped (he’s had 18 goals in 25 Serie A appearances with Milan), but the team is without direction right now and certainly misses Stephan El Shaarawy. Does Balotelli respond with renewed second-half motivation to put his squad among the top ranks of Serie A by season’s end? His international experience is pretty remarkable for a 23-year-old. He has appeared in 29 matches with 12 goals. Euro 2012 was his international coming-out party, especially after his sensational 2-goal effort in the semifinal versus Germany. Italy would go on to get smoked by Spain 4-0 in the final, but the world had discovered an unreal talent that had many promising years ahead. He will undoubtedly feature centrally in Italy’s World Cup 2014 plans. Italy finds themselves with Uruguay, Costa Rica, and England. They should be favored to finish 2nd, but don’t count out a stoic, yet determined Balotelli willing them to a first place group finish. His impressive strength and powerful shot is where he stands out. Even top-level strikers can’t imagine what it would be like to possess his athleticism. Balotelli has never looked his age on the pitch either. I mean, just look at him as a 17-year-old at Inter. However, he’s not just a physical specimen. 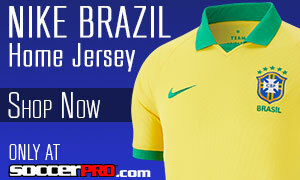 Mario can also be a set-piece specialist and is noted for his solid technical ability. Still, he gets into trouble with silly challenges that earn him cards. Many times, you can see the immaturity when he makes those mistakes. In the future, he certainly needs to gain more self-control and discipline that won’t get him into trouble out there. Mario Balotelli is seen as routinely crazy. The stories of his anarchy are countless: There was the time he parked his Ferrari F12 in the middle of the street because he was shopping at Louis Vuitton. The time he accidentally set his own house on fire with friends because of a rogue firework the night before a match against Manchester United. The time he couldn’t figure out how to put his training bib on TWICE. He has been in three separate car crashes (!) with beautifully expensive vehicles each time in the last three years. The range from simply amusing to dangerously self-destructive is truly astounding. A surprising amount (if not all) of these have proven to be true. But it has already gotten to the point where the 23-year-old is automatically and unfairly accused of everything. Some of this is deserved, some of it isn’t. Not to mention the continually embarrassing racism present in European soccer that has followed him his whole career. Balotelli is, without a doubt, young, immature, and rich. This is never a healthy concoction. It leads to disrespectful behavior on and off the field. Nevertheless, these are also all the things that make Super Mario so fascinating and electric to watch. 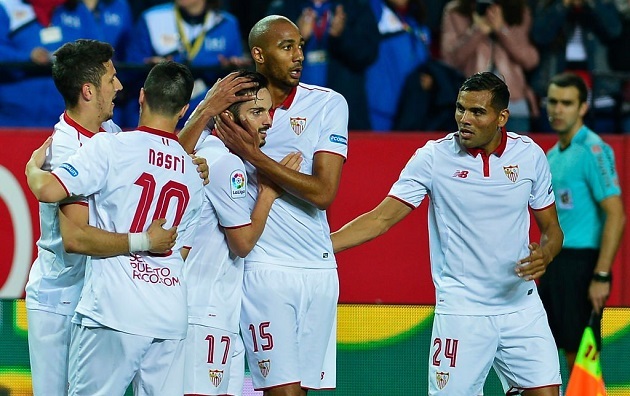 The latest Puma theatrics (even if you see them as merely empty spectacle) are a good example of a positive, headline-making move. He is now Puma football’s most marketable player. At Nike, he was just another in a group of fantastic and attractive athletes. At Puma, he can be the leading man he was meant to be. He is instantly set apart from the other Puma guys. Sure, Radamel Falcao, Yaya Touré, Cesc Fàbregas, and Sergio Agüero are all insanely talented players. But, go ahead and ask your friends who don’t follow soccer if they have heard of any of those names.